Normally, I review movies. But because of the love for these cupcakes from everyone at our recent Art After Dark event (pictures to come soon! ), I thought I needed to share. I altered the original recipe that I found here and the frosting recipe was found here, but to make your life easier I included my way below. Enjoy this lovely treat! Preheat oven to 350 degrees F. Line muffin pan with paper liners In a medium bowl, cream together sugar and butter. Beat in eggs and vanilla. Combine flour and baking powder, then combine with creamed mixture and mix well. Stir in milk until batter is smooth. Spoon batter into pan. Bake for 20-25 min. 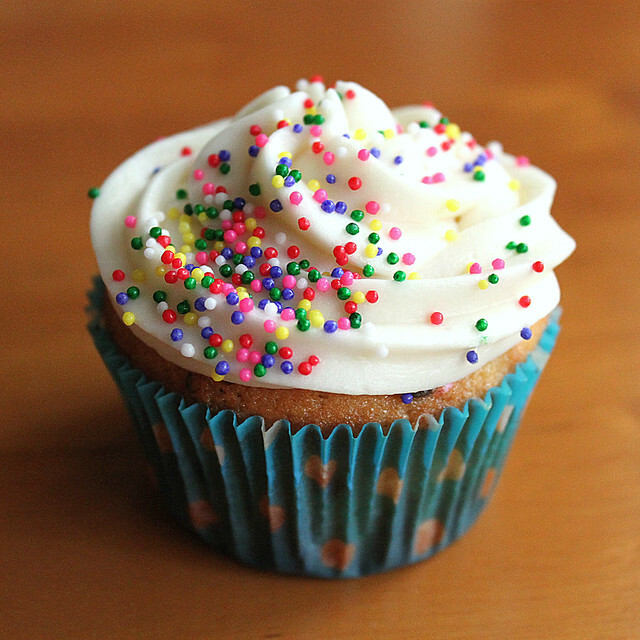 Cupcakes are done when it springs back to the touch. With an electric mixer, cream butter until smooth. Add vanilla extract. With mixer on low speed, slowly add in powdered sugar. Scrape down sides of bowl. Add milk and beat on high speed until frosting is light and fluffy. Add in more sugar as needed.